In the first quarter of 2017, NeighborhoodScout’s Scout Vision® forecast that the Denver area – then flying high in real estate appreciation – would decline in value. In April 2017, the Denver Post covered NeighborhoodScout’s forecast. Yet the local Denver real estate community said a decline would not happen, things were just too good to decline. A year and a half later, in September 2018, headlines in National Mortgage News read: “A chill taking hold in metro Denver’s housing market,” confirming NeighborhoodScout’s prescient forecast. In the 2nd quarter of 2017 NeighborhoodScout’s Scout Vision forecast that the Las Vegas area would rise to become the nation’s highest appreciating metro area. 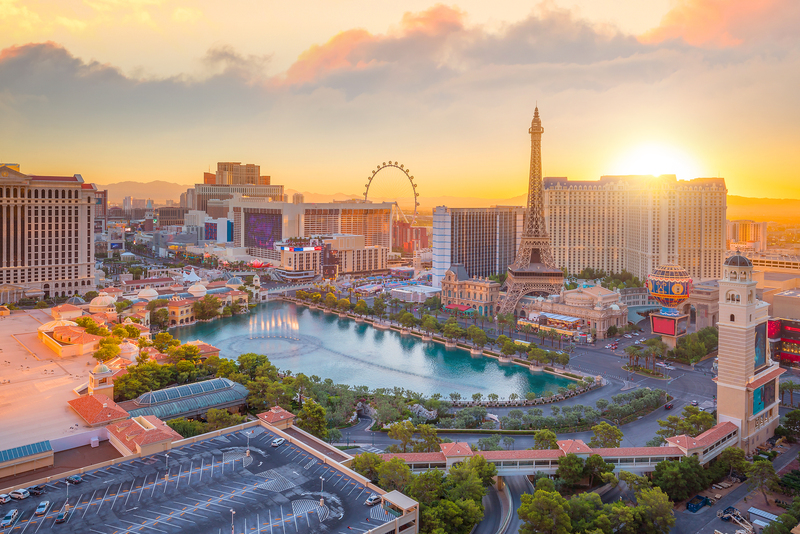 One year later, in August 2018, the CoreLogic Case Shiller Home Price Index reported that data from the preceding month had shown Las Vegas had risen to become America’s highest appreciating metropolitan area – proving again the veracity of NeighborhoodScout’s data in predicting real estate trends for investors. What does 2019 hold for the real estate market? Here we report what NeighborhoodScout reveals for the national real estate market for the coming year, including its hottest metro areas and hottest ZIP Codes. And the ones that aren’t forecast to be so hot. 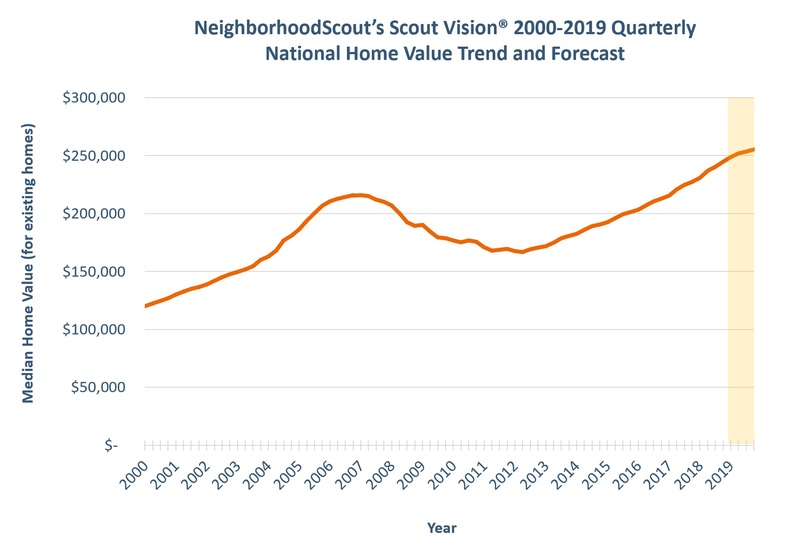 NeighborhoodScout forecasts a more modest 4.5% increase in national real estate values in 2019, a significant deceleration from the 2018 increase of 7.6%, as market price increases are projected to slow substantially. Over the next three years, through 2021, the forecast calls for an even more modest 3.1% annual increase in real estate values, and a decline of -2.4% from 2021 to 2023. High real estate prices, increasing faster than income in many areas of the U.S., have started to weigh on real estate values as affordability has declined. In fact, it now takes more years of the median household income in America to buy the median priced house than it did in 2006, at the height of unaffordability in the last boom, and just prior to the real estate market collapse. Housing affordability is a key measure to track when forecasting values and housing bubbles. Buying a home is also more expensive now than it was a year ago due to the cost of borrowing for a home mortgage, which has been rising slowly as the U.S. Federal Reserve raises interest rates from previous historically low rates. Still, NeighborhoodScout does not predict a nationwide contraction in real estate market value for 2019, much less a collapse, but rather a more modest national price increase as market value increases slow significantly. 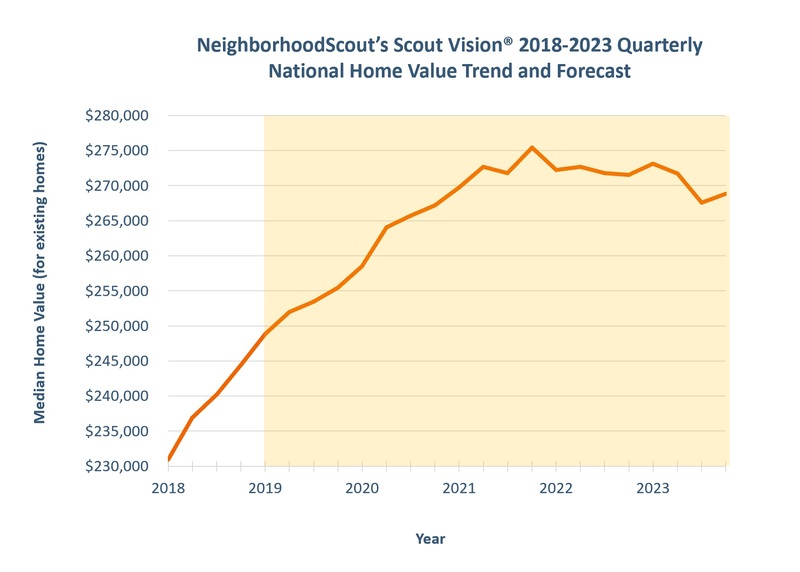 Why do NeighborhoodScout’s data not forecast a 2019 price reversal, much less a collapse? Because there are many fewer high-risk adjustable rate or interest-only teaser loans that have been originated in recent years than there were leading up to the great recession in 2008. With more conservative lending practices, fewer consumers are strapped with mortgages they cannot afford, and thus widespread mortgage defaults are less likely. Add in that energy prices have remained low, unemployment is at historically low levels for the nation, and the fundamentals that drive housing prices in the U.S. are sufficient that overall national real estate values are forecast to modestly increase, but slow that increase, through 2019. But the broad national picture hides a far more dynamic story of the real estate markets where fortunes are to be made and lost. 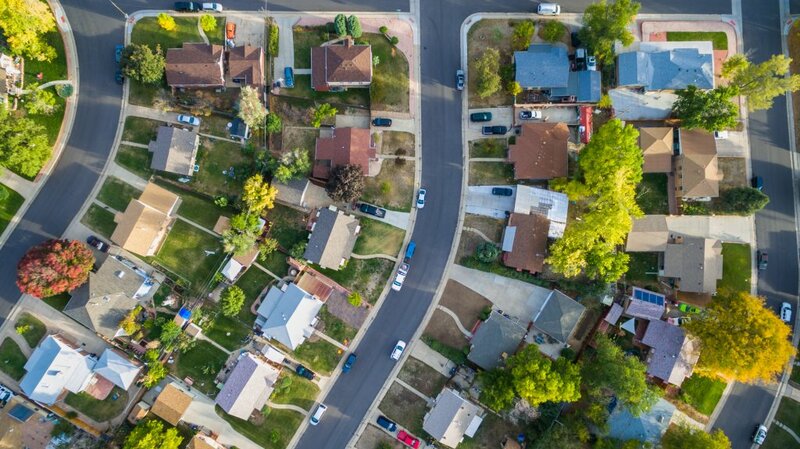 While macro economists tend to describe general conditions for the nation’s real estate market, NeighborhoodScout’s team of PhD geographers studies each metro area, ZIP Code, and neighborhood in America to understand the local real estate market. 2019 is expected to see some big winners and losers. In 2018, the ten most expensive metro areas in the U.S. had an average home price appreciation of 8.3%. For these metros, this home price expansion is forecast to decelerate by nearly half to just 4.7% in 2019, as real estate prices begin to outstrip incomes and residents and investors begin to move their real estate investments into other markets. 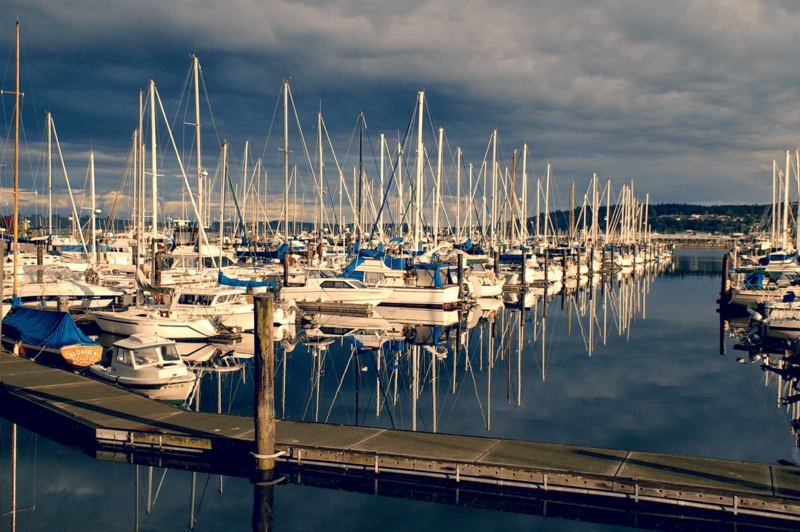 As the most expensive real estate markets rise in price more slowly, investor money is forecast to flow into new metro areas offering bigger annual returns. Yet other metro areas are forecast to decline far more than the national average. Here are the top ten and bottom ten metro areas NeighborhoodScout forecasts for 2019 real estate home price appreciation. What do the top 10 metro areas forecast for 2019 real estate price appreciation have in common? Three patterns are evident. First, metro areas that are less expensive than their high-priced neighboring metro areas in the same region. These offer strong income growth, broad job expansion opportunities, and access to employee talent, while being more affordable than the top priced regional metro areas. Late in real estate recovery cycles, we see smart money often flowing to nearby areas offering relative bargain prices, lifting those prices on the strength of their fundamental economic foundations. A second pattern is also revealed by the data. Desirable, often expensive, resort metro areas rise in value as investors buy property in these areas after experiencing strong price growth and equity increases in their primary residences in major metro real estate markets. A third pattern: Some metropolitan areas that experienced substantial real estate price corrections during the great recession of 2008 are still rebounding, and seeing substantial home price appreciation opportunity in 2019. These are driven by income growth, combined with population growth, and home prices still in recovery due to real estate affordability staying in check in such areas due to wage increases. What do the bottom 10 metro areas forecast for the greatest 2019 real estate price contraction have in common? While they vary geographically across the U.S., they share challenges brought about by economics. Combinations of such elements as real estate vacancies, low or declining wages, population loss, and job declines, weigh on real estate prices and are likely to bring home prices down in these metros. A number of these metros have substantial energy sub sector economies that are forecast to do poorly in the stock market in 2019 as energy prices remain at inflation-adjusted lows. Real estate is all about location. It should come as no surprise to seasoned investors that metro areas can experience very different real estate markets from one another. The same is true for ZIP Codes, even within the same metro area. Some ZIP Codes will increase in real estate values far faster than others, just a few miles away. Such price differences can add up to large gains for real estate investors who know where to invest: if you focus on the right locations. So what makes a ‘right location?’ Using nearly a half century of data in combination with machine learning and artificial intelligence, NeighborhoodScout’s PhD research team has uncovered repeating patterns in which locations grow in value. And those patterns change over time, shifting in context of the market and hyper-local conditions in and surrounding not only ZIP Codes, but micro-neighborhoods 10X smaller than the typical ZIP Code. The ‘right locations’ most often combine outstanding access to high numbers of high paying jobs; particularly within twenty minutes travel time of the ZIP Code. In combination with steep price advantages over adjacent and surrounding neighborhoods, which will draw in new investment and increase prices, a growing regional economy and population, often within half a mile of the ZIP Code itself, low violent crime rates, or a trend to declining violent crime in the neighborhood, walkable access to passenger rail, increasing educational attainment of residents in the location, improving schools that serve the neighborhood, and hundreds of other variables that work to drive prices upward in specific neighborhoods and ZIP Codes. Here are the top ten and bottom ten ZIP Codes NeighborhoodScout forecasts for 2019 real estate home price appreciation. Real estate investors, lenders and others can unlock full reports by address or by neighborhood on NeighborhoodScout.com, or subscribe for larger report volumes. An API provides a real time data feed for high volume data needs. About NeighborhoodScout and Location, Inc. Location, Inc., parent company of NeighborhoodScout, is a leader in geographic data sciences, providing street-and address-level location intelligence and predictive analytics for businesses across the U.S. and Canada via web-based reports and streaming data. Since 2000, the company has amassed highly accurate and comprehensive catalogue of spatial data products, with complete, national coverage and sub-ZIP Code granularity. A pioneer in building micro-spatial data products, Location, Inc. specializes in real estate market insights and projections, and crime and hazard risk products for the real estate, insurance and finance sectors. More than 75 million people and businesses have leveraged the company’s data products to make informed location decisions, fuel major investments, mitigate risk, protect assets, and uncover opportunity. For more information visit locationinc.com and neighborhoodscout.com.